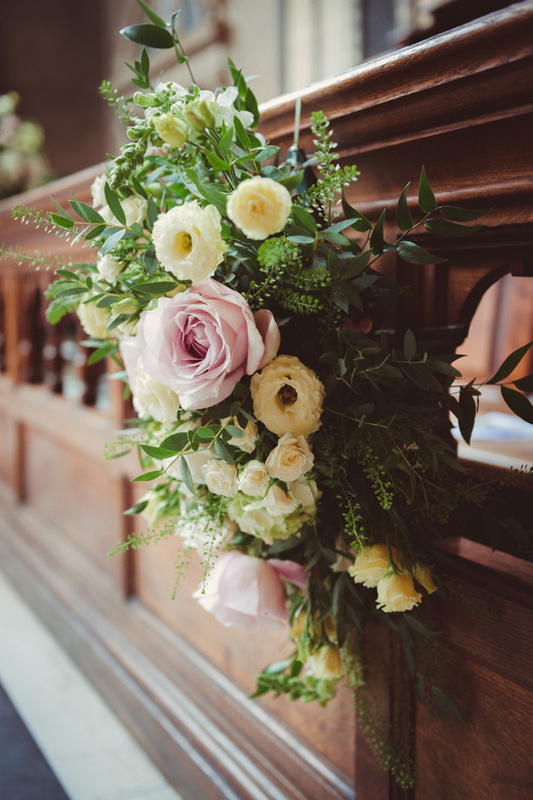 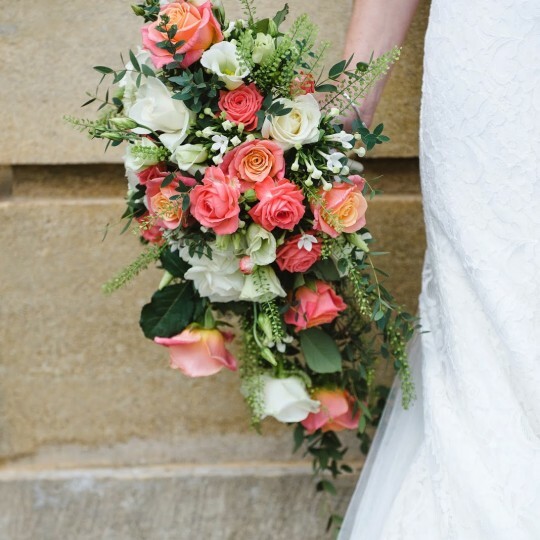 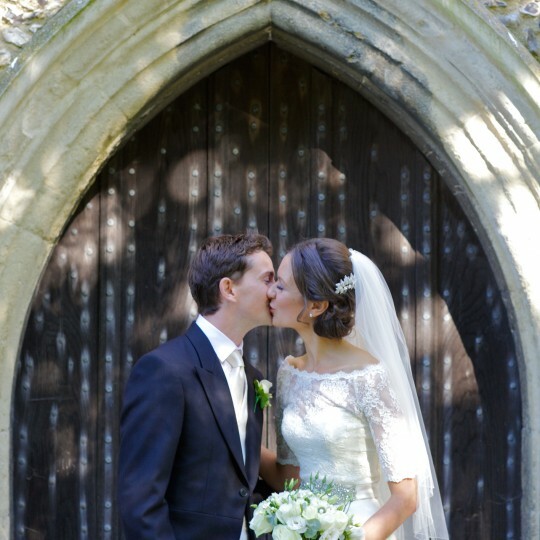 Marc and Gaelyn's fabulous wedding flowers at Hertford College, Oxford and the elegant Le Manoir aux Quat' Saisons - Joanna Carter Wedding Flowers | Oxford, Oxfordshire, Berkshire, Buckinghamshire and London. 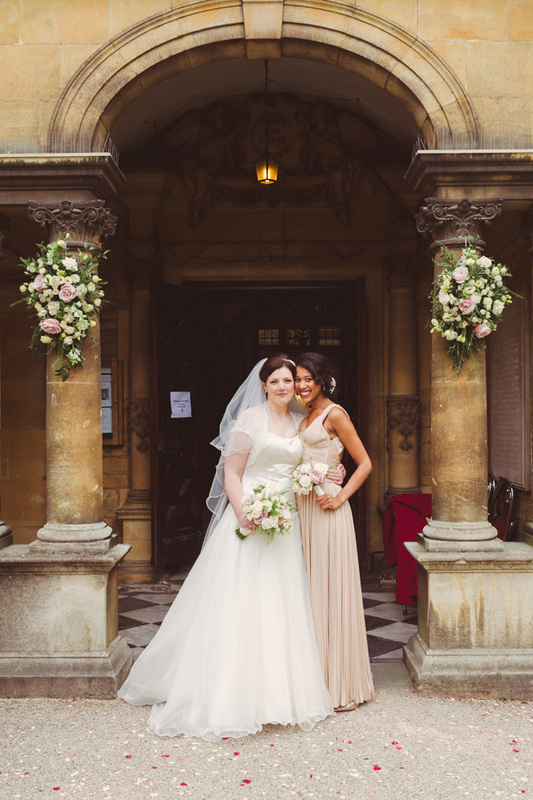 Gaelyn chose a palette of soft pink and ivory for her flowers which worked perfectly in both settings. 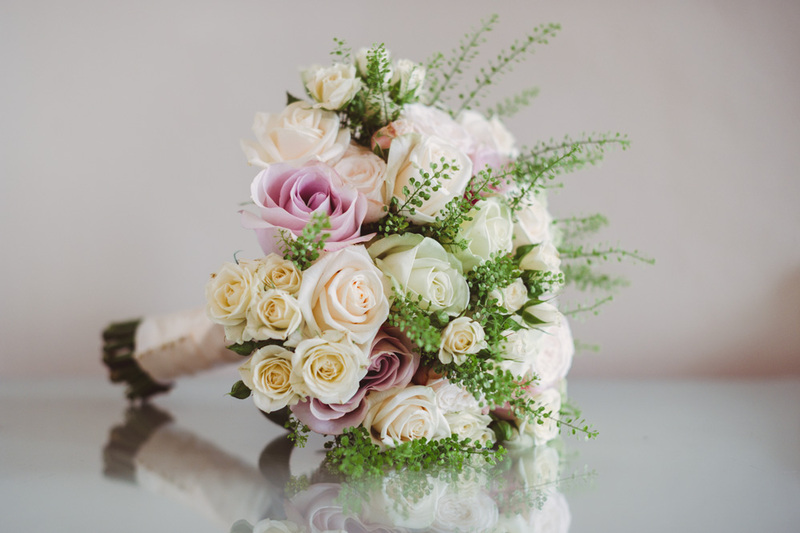 Her bouquet of secret garden roses, ivory spray roses, thlaspi green bell and vendella roses was simple but beautiful. 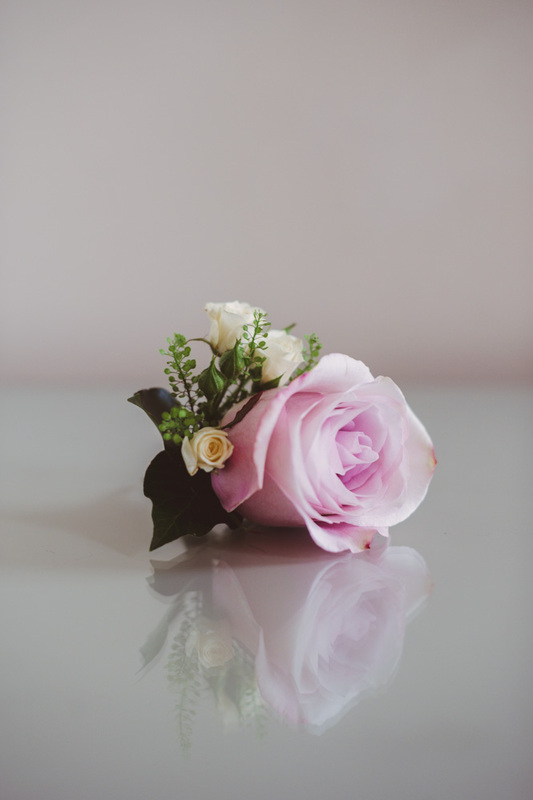 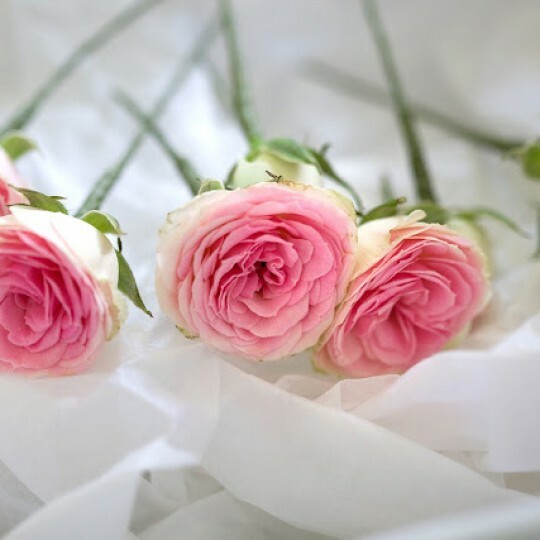 Gaelyn chose lovely jacket corsages for the ladies in the wedding party using soft pink secret garden roses and ivory spray roses. 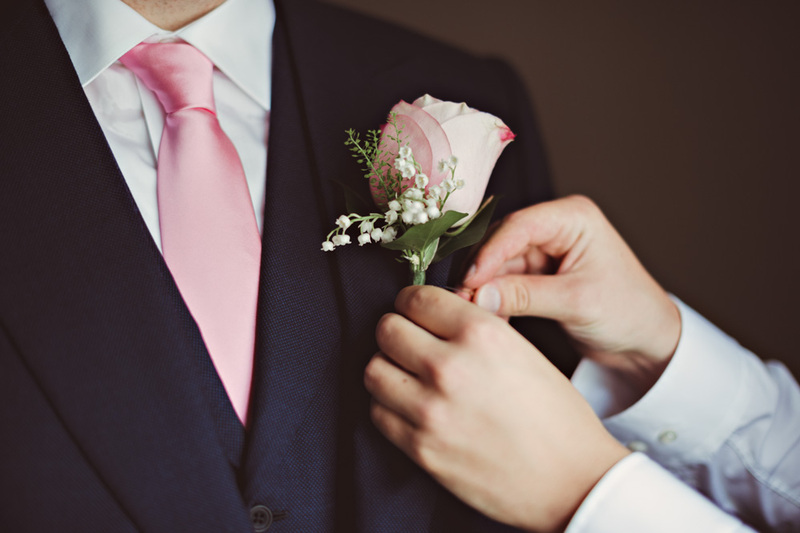 Marc and the other men in the wedding party had similar buttonholes that included fragrant lily of the valley and looked lovely. 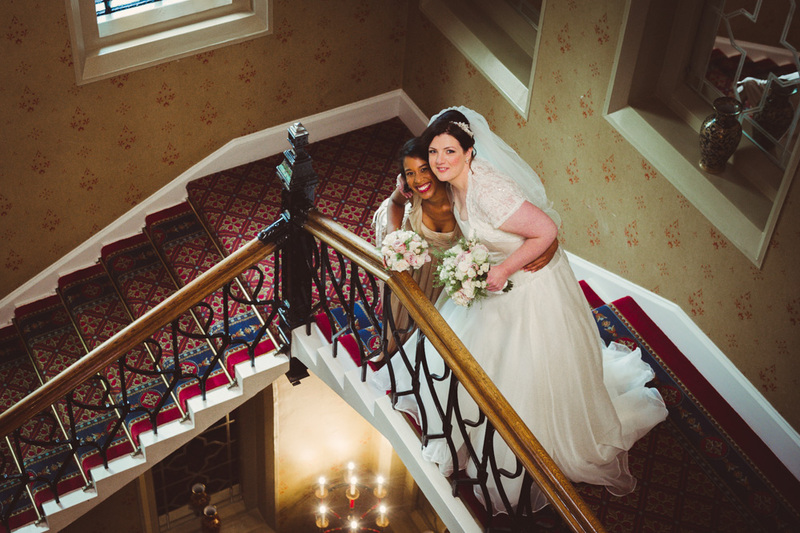 Gaelyn and her bridesmaid got ready at the elegant Randolph hotel in Oxford city centre which was a great photo opportunity as they left for the chapel at Hertford College. 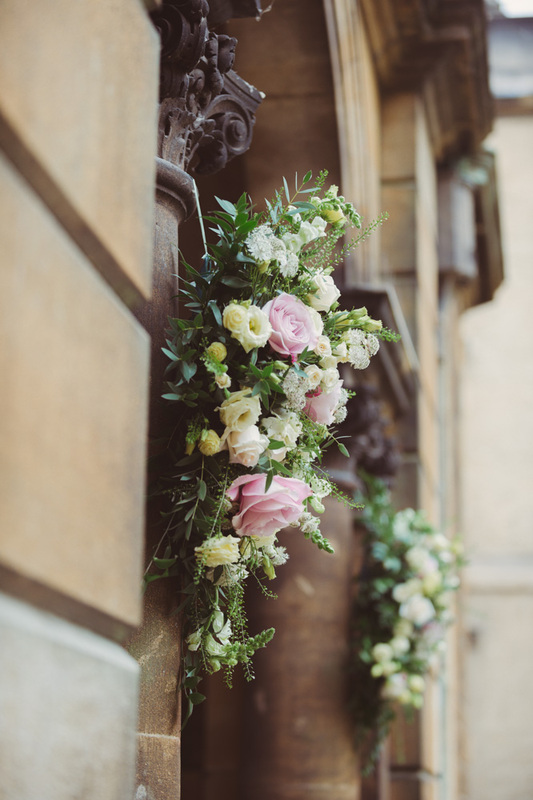 At the chapel Gaelyn asked us to hang floral swags at the entrance to greet guests. 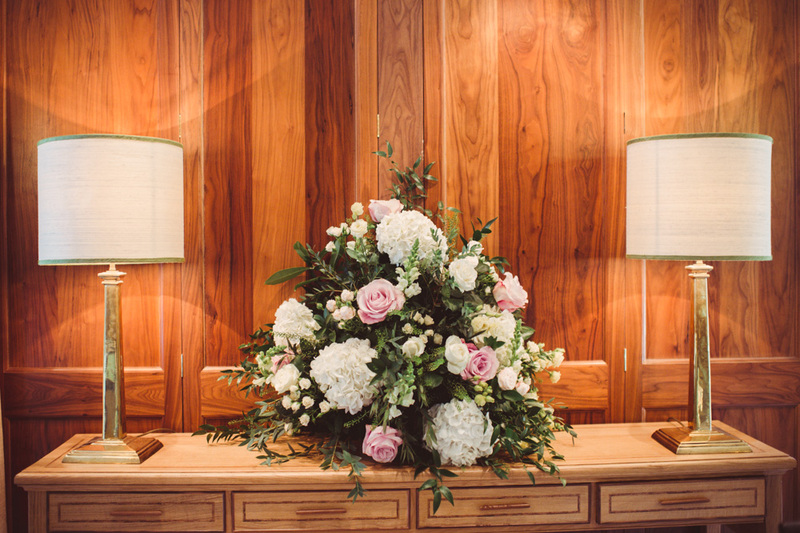 Inside we added large pedestal arrangements , while more swags hung from the front of the wooden pews facing in to the aisle. 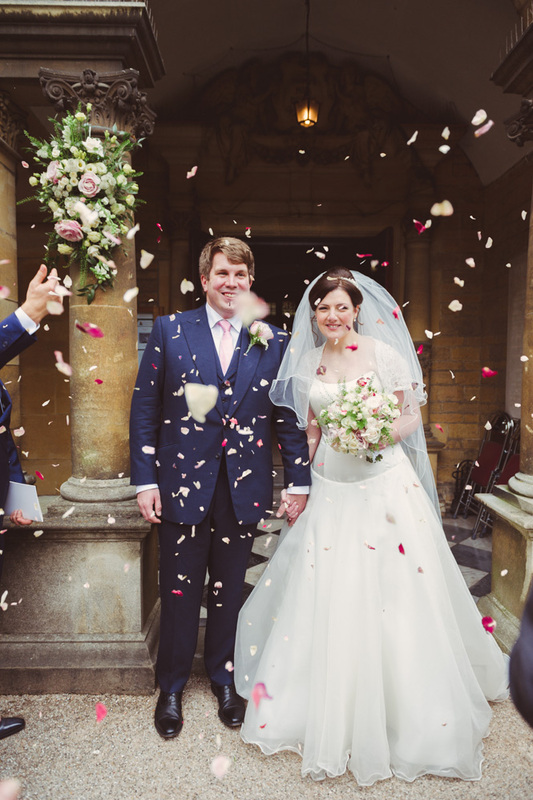 After the ceremony the couple had photos and a drinks reception in the Quad before heading to Le Manoir aux Quat’ Saisons for their wedding breakfast. 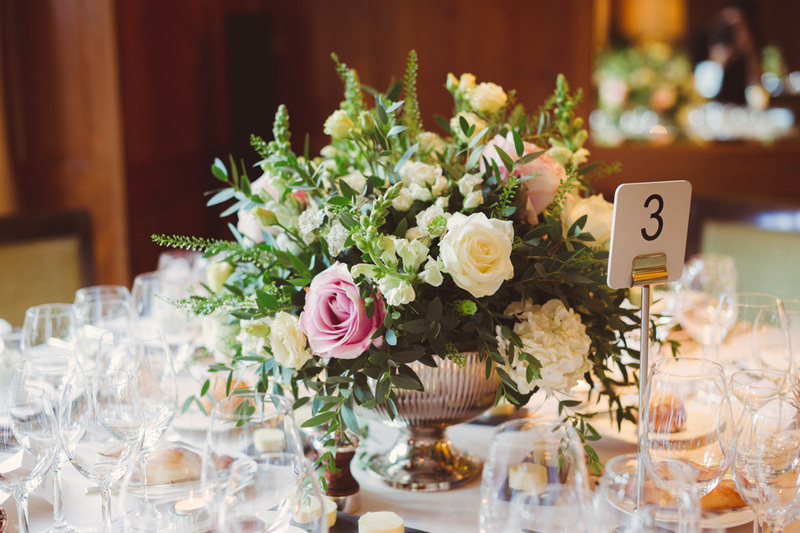 At Le Manoir we placed silver rose bowls on the dining tables and decorated the table plan with a garland. 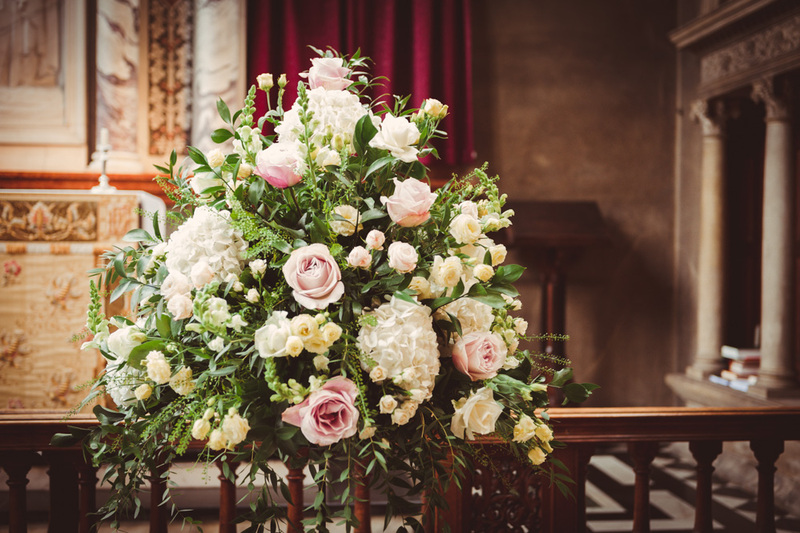 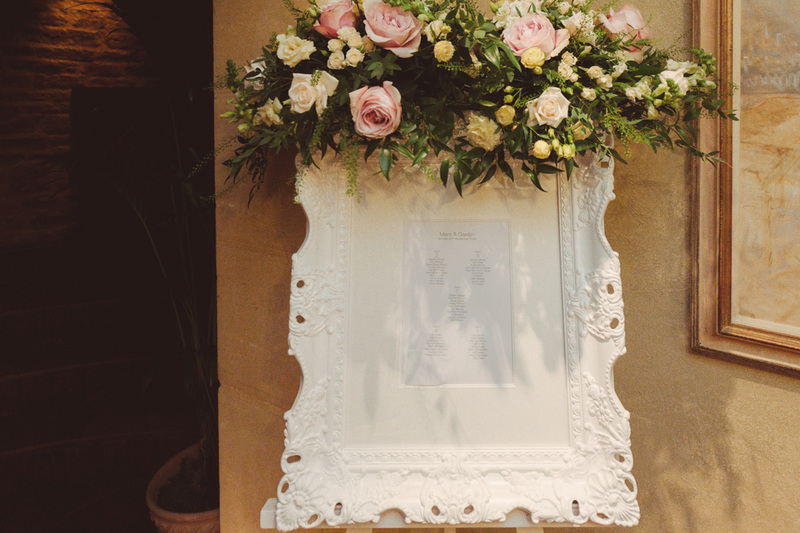 We also scattered all the swags from the chapel on side tables and on the large fireplace mantelpiece so the venue was full of beautiful flowers.